This was a great adaptation to a classic dish. I really liked this pork version and I might even like it better than the original chicken version! It is somewhat involved because the pork will need to be pounded thin and the whole process of breading and frying takes some time. However to make this dish ahead of time and make it easier for me, I prepared the breaded and browned pork in advance. Once cooled, I wrapped each piece of breaded pork in foil and placed it in the freezer. I then heated the pork from frozen in a 350 degree oven for about 10-15 minutes. After they were warmed through, I topped each breaded pork with marinara sauce, basil and cheese, then broiled it until the cheese melted. So this is definitely a dish that can be enjoyed on a busy weeknight - you'll just need to prepare in advance accordingly. As for adapting this to a gluten free version, it was pretty easy too. GF breadcrumbs can be pricey so instead, I finely crushed gluten free crackers in a food processor (potato chips work well too!) and used that as a breadcrumb substitute. You can either use an all purpose gf flour blend (xanthan gum not required) or any gf flour will do since the breading mixture combines the flour with cheese and breadcrumbs. Lay the pork chops out on a cutting board and cover with a large sheet of plastic wrap. Using a meat mallet, pound pork chops until they are about 1/2 inch thick. Season the pork chops on both sides with the salt, pepper and garlic powder. Set three shallow pans side-by-side. Place the flour in one, the eggs, milk, and lemon zest in another, and the bread crumbs and Parmesan in another. Dust the pork chops in the flour and shake-off any excess. Working one at a time, dip the pork chops in the egg wash to coat, then transfer to the bread crumb mixture and coat evenly, shaking to remove any excess. Preheat the oven to broil.Set a 12-inch sauté pan over medium heat and add the olive oil. Place half of the breaded pork chops in the hot oil and cook until golden brown, about 1-2 minutes per side. Transfer the browned pork chops to a foil-lined baking sheet. Repeat with the remaining pork chops. 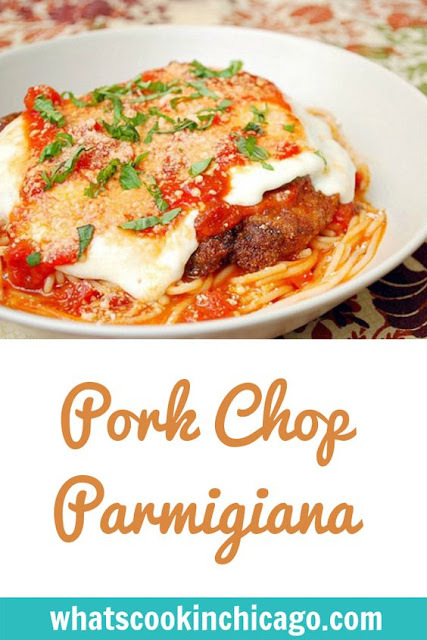 On each pork chops, spread 2 tablespoons of the tomato sauce over the top, followed by placing 2 whole fresh basil leaves over the sauce and lastly top with 2 slices of fresh mozzarella cheese. Place the baking sheet under the broiler and cook for 2-3 minutes or until cheese has melted. Remove from the oven, and garnish with chopped fresh basil and additional finely grated parmiggiano reggiano cheese . 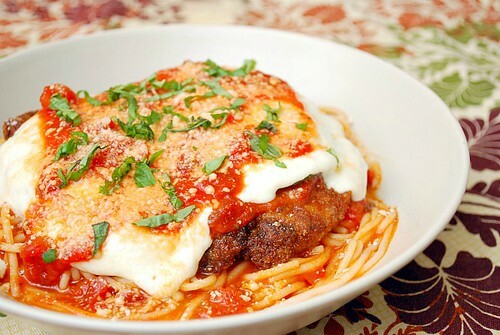 Serve over cooked spaghetti or linguine with additional sauce if desired. Oh my goodness, this was delicious. I don't know how to act, so I did 3 slices of mozzarella, but other than that, it's perfect as is.